I was in prayer this morning asking the Lord for comfort, strength, peace, healing and His presence for several of the people in our church who are going through very difficult times. I truly believe that prayer is the “best thing” that we can do for others, and as I was considering the various situations facing these brothers and sisters in the Lord, I was reminded of a video‐essay I saw about Yosemite National Park. This program captured my attention because my husband and I had been to Yosemite several years ago and we found it to be an awesome manifestation of our Lord’s creativity and beauty. What really captured my attention was the discussion of the Park’s Giant Sequoias and the role that fire plays in their sustainability. The Narrator discussed fire in the Park as being a necessity for the forest, and I recognize this as a correct generalized proposition that is true of any forest woodland. Without fire, the underbrush would become so dense that seedlings would not be able to take root, etc. This is a picture that we took on our visit to the Park which shows a fire scar that is so severe that the inside of the tree has been burned out and the tree resembles an old‐time wooden clothespin, perhaps for Paul Bunyan’s laundry! 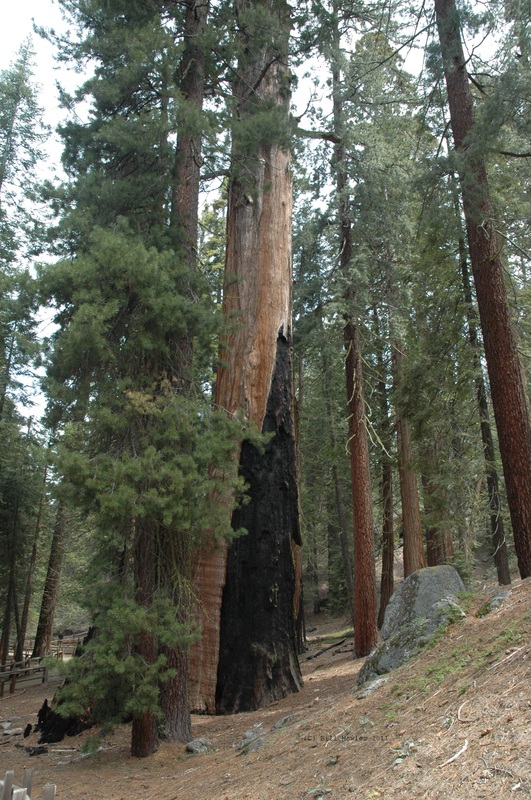 The Narrator of the video-essay stated that the Giant Sequoia tree’s bark was extraordinarily thick and the cambium layer, just beneath the bark, has fire resistant properties to enable the trees to survive severe forest fires. This statement is consistent with one of the plaques in the Park. 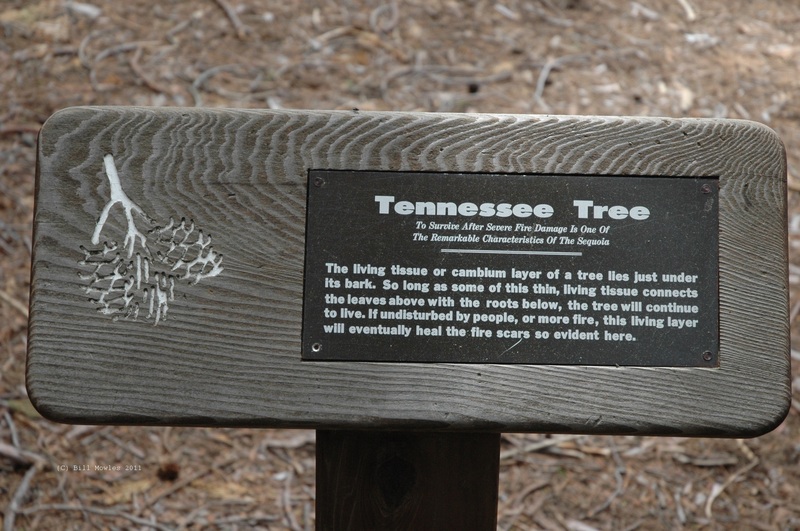 Giant Sequoia Tree plaque for the tree Tennessee Tree, with explanation about cambium layer beneath bark that enables trees to survive forest fires. 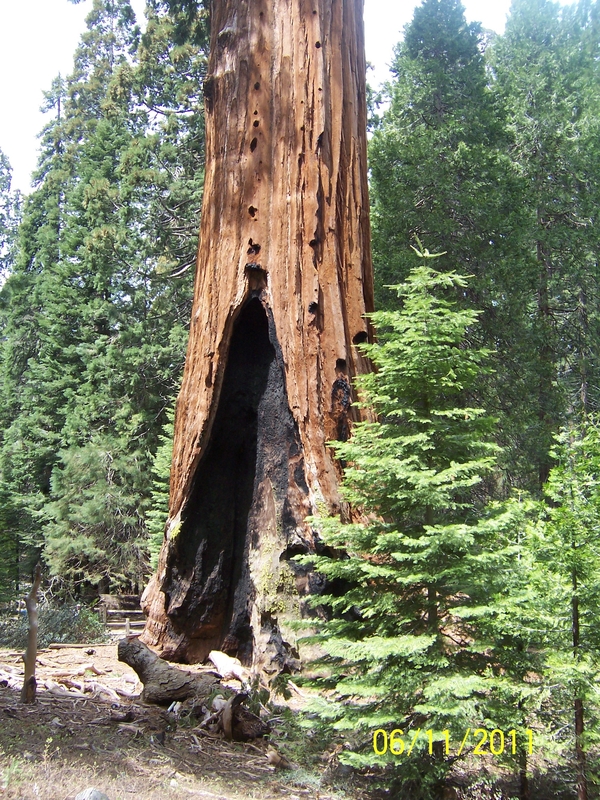 The Narrator continued to describe how the Giant Sequoias cannot survive without periodic fires. I thought I misunderstood what he said – why would these majestic trees require fire for their survival – they might successfully endure the wildfire, but to say that they require it is an entirely different proposition, and one which surely must be incorrect! I was intrigued by this statement and, after doing some research, I found that one of the primary requirements for Giant Sequoia seedlings to grow is full sun. A glance at the forests in which these trees thrive reveals that, while the mature trees have full sun due to their towering height, there are multitudes of trees around them which, although dwarfed by the Giant Sequoias, are tall trees in their own right. The result of this, of course, is that the Giant Sequoia seedling is beneath the neighboring pines, oaks, and whatever – without the benefit of full sun. 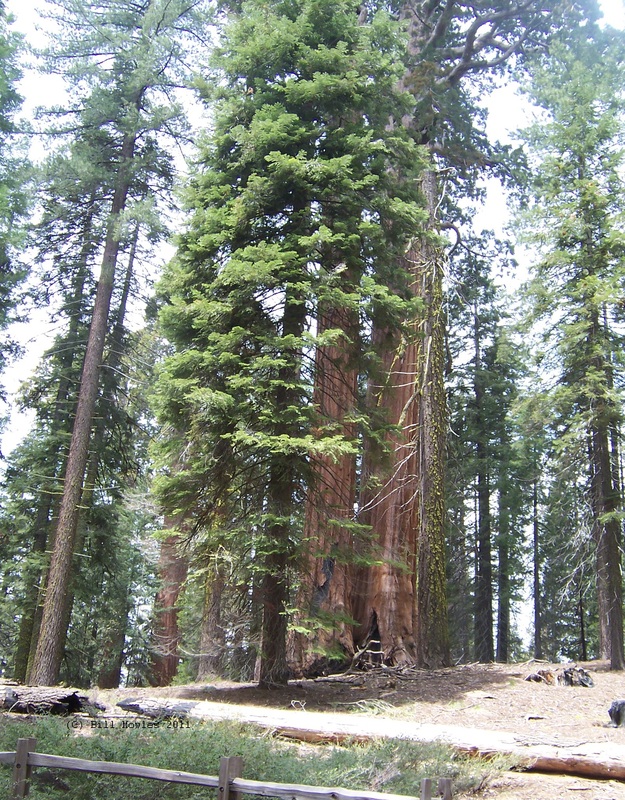 In short, the Giant Sequoia Trees require periodic wildfires so that the underbrush and smaller tree vegetation can be cleared so as to provide the correct environment for successful germination of the sequoia seeds in full sun. Giant Sequoia fire scar with seedlings nearby. But, as the television marketer says, “Wait, there’s more!” Not only does the wildfire provide the open nursery for the seedlings, the fire actually is required to release the seeds from the cone in the first place. It is no secret that extremely hot air accompanies a forest fire; for me, the surprise was that the hot air in the canopy of the massive trees dries and opens the trees’ seed cones causing the release of large numbers of seeds to the forest floor, which, because of the clearing accomplished by the fire, has been transformed into the optimal seedbed for the seeds to take root and grow into images of their ancestors. Besides being an interesting aspect of the Lord’s natural world and besides showing the care that He took to insure the sustainability of His creation, the soul‐searching began when I considered the illustration provided by the Giant Sequoia Trees in the connection between the fire and the resultant beauty. It made me consider how I respond to the fire circumstances in my own life? Am I able to look past the immediate pain and difficulty so as to see the beauty ahead? Do I endure the difficulty with anticipation for the good that our Lord will accomplish through it? Or, do I, like Jonah, run in the opposite direction so that I avoid the problem and pain? Do I even recognize that there is a cost for avoiding the trial … lost lessons learned and more agonizing trials ahead for which I could have been prepared, or perhaps which could have even been avoided, if I had paid attention to the initial difficulty? Do I say what Joseph said to his brothers? Genesis 45:4-7. Or, as my own paraphrase would render this passage, you may have meant to hurt me, but actually you were fulfilling God’s plan to provide a way to protect you and your families from the death that would surely have come during this severe famine. When we are in the midst of the maelstrom, when we can’t see where things are going, through faith we can have confidence that God is sovereign and that He is working things out for His purposes and the Christian’s ultimate good. Even if scars remain, there will be beauty that will come. The nail piercings in our Lord’s Hands reflect just some of the excruciating suffering He endured for us on the cross, but they are beautiful for those who believe in His Name for salvation. But for what those scars represent, we would not have His righteousness to cover our sins and we could not call God “Abba Father”. Mark 14:36; Romans 8:15 and Galatians 4:6. God is sovereign in all things. He provided for the Giant Sequoia Trees, and He will provide for His children. See Luke 12:22-31. Praise His Name as we trust in Him and in His unfailing grace, even as we go through the flames of trial that confronts us, by whatever name it is called. As the Psalmist said: “Praise the LORD! O give thanks to the LORD for he is good, for his steadfast love endures forever!” Psalm 106:1. < HIDING IN PLAIN SIGHT!